” The strike is over. Hollywood’s costly 100-day walkout came to a widely welcomed end Tuesday after members of the Writers Guild of America voted overwhelmingly to go back to work. More than 90% of the 3,775 writers who cast ballots in Los Angeles and New York voted to immediately end the work stoppage, capping the entertainment industry’s most contentious labor dispute in recent history. “Rather than being shut out of the future of content creation and delivery, writers will lead the way as TV migrates to the Internet and platforms for new media are developed,” said Patric M. Verrone, president of the WGA, West. On Feb. 25, writers are expected to ratify a new three-year contract that ensures them a stake in the revenue generated when their movies, television shows and other creative works are distributed on the Internet. Whether the benefits from the new contract will be enough to offset the income writers and others lost because of the strike is a matter of debate. Steven Beer, an entertainment attorney at Greenberg Traurig, predicted that working writers may have fewer opportunities as studios use the strike as a means to cut programming budgets, greenlight fewer pilots, reduce fees and limit the number of production deals on their lots. “Writers got hard-fought and well-earned improvements, but it could be tougher sledding for the rank and file in the future,” he said. The new contract gives them residual payments for shows streamed over the Internet and secures the union’s jurisdiction for programming created for the Web. Handel noted that studios had originally balked at writers’ demands for new-media residuals, proposing a multiyear study instead. Yet the new contract falls short of what writers were initially seeking. “It’s a good deal but not a great one,” said Handel, adding that both sides made key compromises. For example, writers received guarantees that any guild member hired to create original shows for the Web would be covered under a union contract. But the tentative contract enables studios to hire nonunion writers to work on low-budget Internet shows, giving them the flexibility they sought to compete in the burgeoning world of Web entertainment. The writers agreement was largely patterned after a recent deal studios made with directors. Writers, however, got some important improvements, especially in pay for shows that are streamed on advertising-supported websites. Writers were unsuccessful, however, in their efforts to shorten the 17-to-24-day window that studios have to stream their shows for promotional purposes without paying residuals. Many writers complained that most viewers watched repeats online within days after a program was initially broadcast. 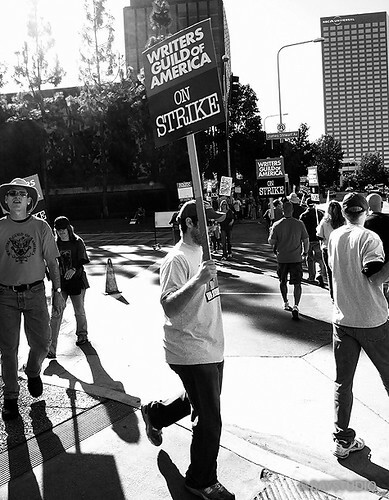 With the strike now over, economists are tallying up the cost to the industry and the Los Angeles region. Measuring the financial losses is inherently difficult and estimates vary widely. Jack Kyser, chief economist for the Los Angeles County Economic Development Corp., estimates the walkout cost the local economy more than $3 billion. Of that total, an estimated $772 million came from lost wages for writers and production workers, $981 million from various businesses that service the industry, including caterers and equipment rental houses, and $1.3 billion from the ripple effect of consumers not spending as much at retail shops, restaurants and car dealers. Still, the total is relatively small considering that the L.A. economy generates $1.3 billion a day.